No matter who you are, where you're from, how much money you have, whether you're a boy or girl, we all have one thing in common: WE ALL LOVE FOOD. This common love can and should be embraced without burden but it is often wed with guilt and undesirable health issues like weight gain, or worse. We often feel bad about the food we love because a lot of the food we have been taught to love isn't FOOD. Food shouldn't make us fat, sick or tired. I'm convinced that IT DOESN'T NEED TO BE LIKE THIS! With a few little tricks and philosophies, we can embrace our love for food without guilt and without hurting our health. You don't need to spend the rest of your life eating kale, moderate indulgences are totally okay, it is just a matter of figuring out the right kinds and the right amounts of indulgence. Delicious things are part of a healthy life style (and make a delicious life!). My favorite food book of all time is French Women Don't Get Fat. It explains the "French Paradox" meaning why French women can drink wine, eat cheese, cream and bread, and somehow don't get fat. How on earth is this?? They have a couple simple cultural guidelines and ways of looking at things (see the quotes below and to the right). I'm convinced the French have something figured out. . They eat slowly, they pick the BEST and freshest of ingredients, they keep their portions small and their courses plentiful and spend hours eating in a nice setting, amongst the company of people they love... NOW THIS IS WHAT I'M TALKING ABOUT. I dig it. Have you ever been to a nice restaurant and had a few course meal? Chances are the portions were smaller than you'd typically serve yourself at home but the flavors were rich and ingredients high in quality. Chances are you ate these slower than you would at home. Chances are you spent more time at the table/eating than you normally would. Chances are you left feeling satisfied and not stuffed. I hope you've had one of these experiences! Have you ever had a delicious fresh tomato in the middle of summer? Or seafood freshly caught out of the ocean? How about an incredible salad with artisan cheese and a homemade salad dressing? 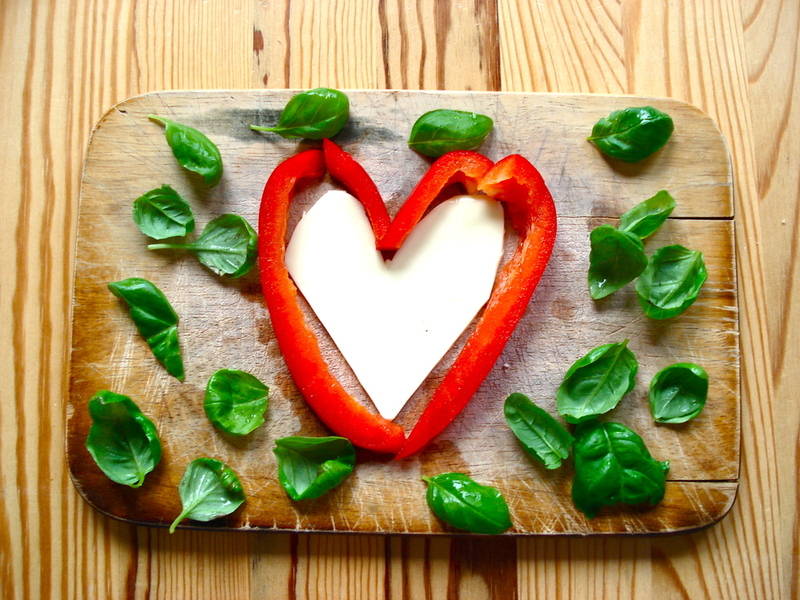 See now healthy food can be just as delicious and satisfying as the typical food we associate with "love". So I challenge you to really embrace your love for food . Embrace fresh, vibrant flavors, things WITHOUT A LABEL :) and slowly enjoy these great things in the company of good people in a beautiful home, park or restaurant.